The BBC Gardeners' World Live show had much to offer as always, from the impressive RHS Floral Marquee to the show gardens, many of which sported miniature Yew hedges instead of the more traditional Box. Celebrating its 21st birthday this year the BBC Gardeners World Live Show (featuring The RHS Flower Show Birmingham) continues to go from strength to strength. Every garden show has its own distinctive feel and this show is no exception due to its many unique features such as the Edible Patch gardens, which cram as many edible plants as possible into a mere 3m x 3m space. The NEC's large exhibition halls, as well as playing host to a plethora of trade stands, also feature one of the largest and best displays of Bonsai trees that you are ever likely to see in the UK. The RHS Show Gardens offer a collection of small gardens from both recognised designers and perhaps more importantly, new up and coming talent in the world of garden design. Each garden has its own unique theme and is built to inspire with a host of ideas to transform your own garden, regardless of size or budget. Most people are familiar with the low-level Box (Buxus sempervirens) hedges often found surrounding borders and lawned areas in many gardens, particularly those found in stately homes. Indeed if you were to think of having a small hedge in your own garden then the ubiquitous box would be your obvious choice. This year at the BBC Gardeners' World show a surprising number of the show gardens sported low-level hedges of Yew (Taxus bacatta) where you would traditionally of found box. While Yew may not be an immediately obvious choice for a hedge of this type, it is actually quite a good choice, like Box being evergreen and hardy and very well suited to shaping and topiary. This is something that I wouldn't have naturally thought of myself, but it just goes to show the real value of attending garden shows like this; not just to look and admire the interesting show gardens, but to get real inspiration for your own garden. What is somewhat bizarre however, is that these miniature Yew hedges were so prevalent in the show gardens this year, while I've never noticed them in a show garden before and certainly not at this year's RHS Chelsea flower show. It's very strange how a fashion can pop-up in one particular show. Featuring over 100 award winning and specialist nurseries from the UK and abroad, the RHS Floral Marquee is an ideal venue to catch up with the knowledgeable nursery folk to discover their top plants for your gardens. With traditional classics and many new varieties there is always something for everyone; from specialist Rose growers like David Austin Roses to Cacti specialists such as Craig’s Cacti House - every taste is catered for. Held at the NEC, the BBC Gardeners' World show shares space with the Good Food Show providing the visitor with ample shopping opportunities for both house and garden. 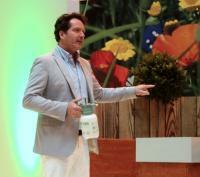 The gardening section of the show also houses the BBC Gardeners' World Theatre, hosted by James Alexander-Sinclair, which features a packed schedule of talks from a variety of TV presenters on a range of gardening topics. The talks last half an hour, but if you're thinking of attending one, always book well in advance as tickets sell out fast. The talks are always interesting and very informative and are well worth attending, if only to rest your weary feet for half an hour. "I draw inspiration everywhere – from colour to quirkiness to walking through the woods or by the beach with the dogs every day. Increasingly I look on the internet. There’s an app called Flipboard that highlights what’s happening around the globe in your chosen areas so the latest in gardening, new trends and architecture or art are served up to me through my iPad 24-7." If you've never been to a garden show before and you don't live too far away from Birmingham, then the BBC Gardeners' World Live show is a good place to start. While the show gardens aren't as spectacular or as plentiful as the likes of Chelsea, they can still prove very inspirational. The Floral marquee is never a disappointment plus you'll have ample opportunity to stock your garden with wonderful new plants and be able to pick the brains of some of the best plantsmen and women in the country. Published on 14 Jun 2013 and Filed under Reviews.